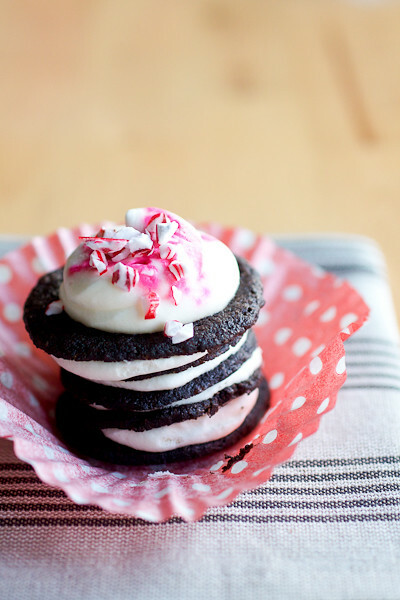 Peppermint Icebox Cupcakes: Homemade chocolate wafer cookies and peppermint whipped cream team up for an incredible holiday cupcake combination. I’ll be the first one to admit that I’m a complete sucker for just about anything peppermint-flavored during this time of year. I was the only one in my family who ever wanted candy canes for the tree and when I graduated up to the foot-long, 1-inch diameter candy cane sticks in junior high, I may have stockpiled a few through February. This year, I’ve already used up more calories on peppermint hot chocolate from Starbucks than I care to admit since the week of Thanksgiving. And I’ve been mopping up the Pinterest- and Foodgawker-induced drool daily. As you can imagine, these peppermint icebox cupcakes were a pretty natural step in my 2012 peppermint obsession. Crispy chocolate wafer cookies are sandwiched between layers of fluffy peppermint whipped cream and as the stacks chill overnight, the cookies soften into deep chocolate cake-like layers. I always feel like traditional cupcakes have a heavy cake:frosting ratio. But these icebox cupcakes completely solve that problem, leaving with you just about equal parts of both. Annnnd, with some extra whipped cream on top for good measure. They’re basically the best holiday cupcake idea out there, in my humble opinion. These peppermint icebox cupcakes were quite the hit at our housewarming party this past weekend and my mom and I had a super fun Friday night putting these guys together! You can certainly buy a few boxes of chocolate wafer cookies for these icebox cupcakes. But I really, really love the homemade version better. They are more chocolatey and less dry than the store-bought cookies are. Needless to say, I fell for so hard for these cupcakes (surprised?) that I ended up sending most of the leftovers home with my parents. I just couldn’t take the risk of being left to my own devices with them in the house with me! 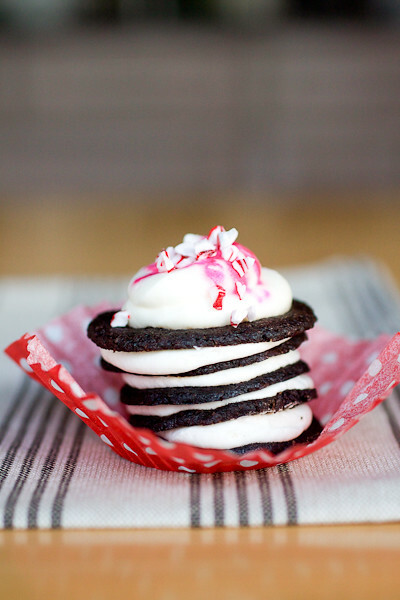 This recipe is based on a traditional icebox cake but it elevates the cake to another level with homemade chocolate wafer cookies and peppermint whipped cream stacked in cupcake form. If you make your own cookies, form the dough into two logs of 1 ¼-inch diameter and cut the chilled dough into 1/8-inch slices so that they will fit inside the bottom of a cupcake liner after the cookies are baked. Store-bought cookies are too large to do this neatly so you’ll need to fuss with the liners a little as you assemble your stacks, but they will definitely work in a pinch. The liners will inevitably relax with the moisture from the cupcakes overnight anyway but I still highly recommend you make your own cookies for this recipe – a little extra effort makes a huge impact here. Chill a large bowl and whisk attachment for 20 minutes prior to starting this recipe. Set out 24 cupcake liners on a baking pan or on a serving tray where you can easily wrap them later (9×13-inch aluminum lasagna pans work great for this). Place a cookie in the bottom of each liner (the cookies should fit snugly). Don’t worry too much if they snap in half while doing this – you’ll never know the difference once they are fully assembled. Add the heavy cream to the chilled bowl and beat with the whisk attachment, starting on low speed and working up to medium-high once the cream starts to thicken. After the cream has slightly thickened, sprinkle the powdered sugar over the cream and continue to whip until stiff peaks have almost formed. Check for desired sweetness. Beat in the peppermint and vanilla extracts for about 5-8 seconds on medium-high until stiff peaks have formed and the whipped cream is thick and scoopable. Transfer some of the whipped cream to a piping bag or a zip-top bag with a hole cut in the corner. Pipe a thin layer of whipped cream onto each cookie (about the height of the cookie) and top with another cookie, pressing down ever so slightly. Repeat until you have 5 layers of cookies then top the 5th cookie with a swirl of the whipped cream, reloading your whipped cream bag as needed but keeping the bowl chilled in between refills. You can either sprinkle on some crushed candy cane at this point (it will melt into the whipped cream overnight and give the frosting a cool pink swirly effect) or wait until you’re ready to serve the cupcakes and top with candy cane then. Chill the icebox stacks for 30 minutes (uncovered) to allow the whipped cream to set up then cover the pans loosely with foil and chill overnight. An unheated garage works great for this if you are limited for space in your fridge. Tara, these sound right up my alley! Amazing. What an awesome idea! Thanks for coming back to comment, Marla!